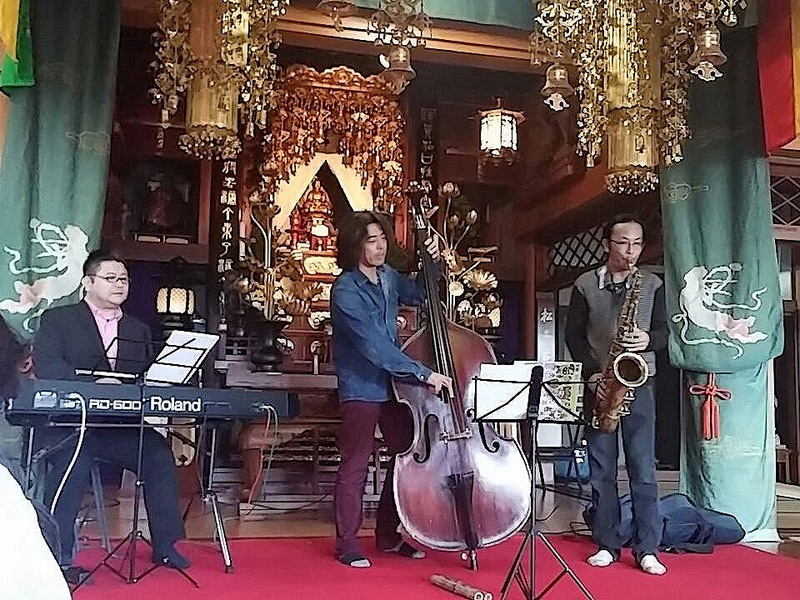 A Jazz concert at a TEMPLE? 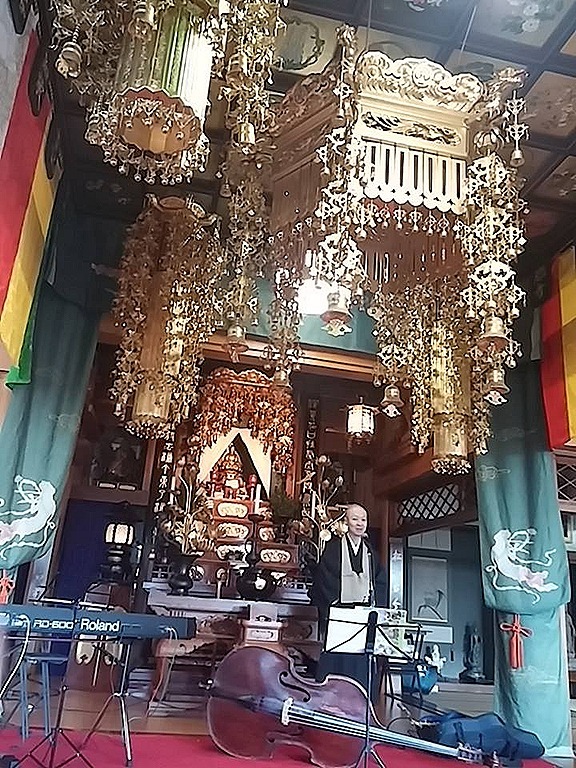 I was very surprised to hear from the deputy head priest of Saikoji Temple in Toyohashi that he was organizing a Jazz concert at the temple, but decided right away to join it because it is rare to have opportunities to listen to Jazz music at temples in Japan. Incidentally, Saikoji Temple is famous in Mikawa area for an event called Tori-no-ichi. 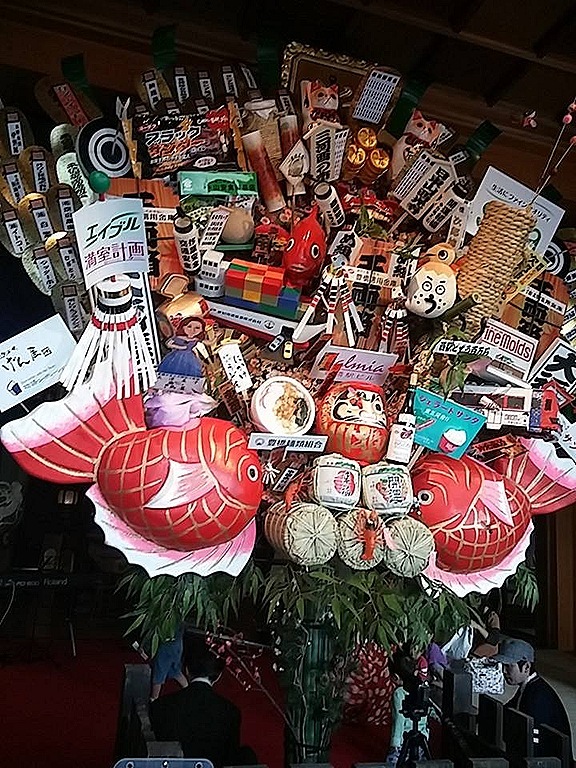 Tori-no-ichi’s literal meaning is the Rooster Fair and a market selling lucky charms for business, especially decorative rakes called Kumade. Actually, the day before the concert was Tori-no-ichi. So, a big Kumade rake was displayed at the temple. The concert was held on November 23rd. I was very surprised again when I entered the temple because the room was packed with little children. 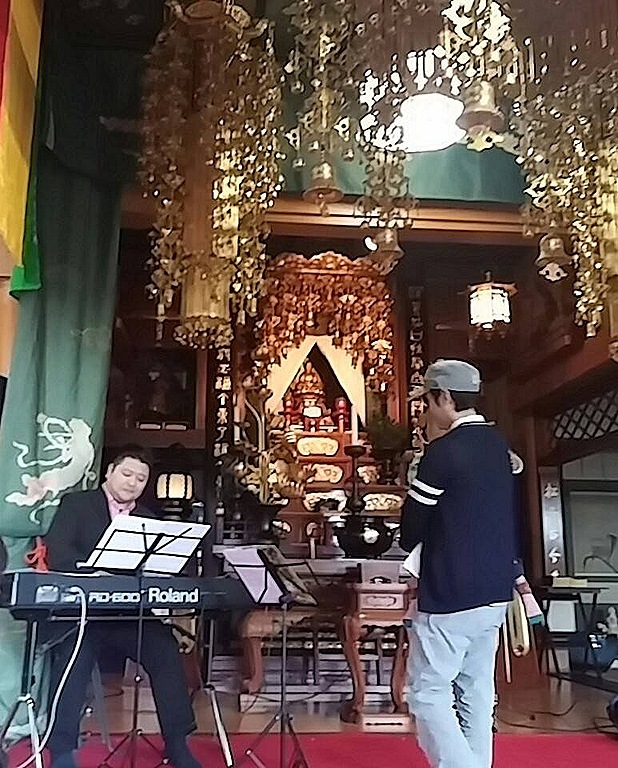 A Jazz concert was certainly held at the temple. It started solemnly with the priest’s greeting to the audience under gorgeous golden decorations. It was a concert indeed, but it was different from others I have experienced. First of all, there were no seats in the room. The audience could sit down on the floor anywhere they liked. Actually, they did not need to sit down. If they wanted to stand up, they could. Secondly, they were able to do anything they liked, for example, dancing, running around, and even making sounds! So many of the children were holding something to make a sound, such as maracas made from milk cartons, percussion instruments made from empty boxes, or rolled-up newspaper. Actually, I did not know until that day that the purpose of the concert was to cultivate children’s artistic expression. 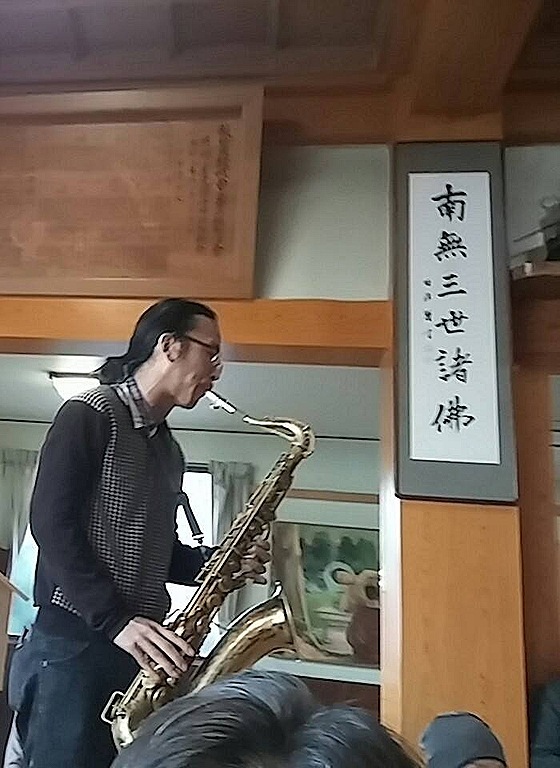 Interestingly, the bassist and the saxophonist moved around in the room while playing, though, keyboardist could not move around. The concert had no separation between the stage and the audience, but had a free atmosphere. I had a great time at the temple! “I said JUST eleven!” Professor Miura said, looking at Chris from the corner of his eyes again. Professor Miura is a specialist in castle architecture at Hiroshima University. Chris Glenn, the famous radio DJ and samurai expert in Japan, was interviewing him about Nagoya Castle’s gates and watch towers. It was November 15th and I was attending the lecture. The number eleven, Professor Miura mentioned, indicates the number of watch towers in Nagoya Castle. Watch towers were the buildings for looking out, the strongpoints of defense, and arsenals before the Meiji Era (1868). “I said JUST eleven!” Professor Miura said again. The whole room was filled with giggling. You know the reason if you have read my former article (Nagoya Castle’s Castle Gates and Watch Towers 1: Death Box). Actually, almost the same thing had happened a few minutes previously when he mentioned the number of castle gates in Nagoya Castle. He said “I said JUST six!” at that time. Actually, two more watch towers were planned to be built in Nagoya Castle. But Osaka Castle, which was the enemy’s stronghold, fell in 1614 before all the watch towers were completed. That newfound victory is why the foundations for those watch towers remain unbuilt-on. One big difference between Nagoya Castle’s watch towers and those of other castles except for its diversity is their largeness. Each tower is as big as other castle’s main buildings (donjon). After the lecture, the participants had a rare opportunity to tour one of the watch towers. It is called Seihoku-Sumi-Yagura, and used to be the main tower of Kiyosu Castle, which was the castle of Oda Nobunaga, one of the most powerful feudal lords in the Age of Provincial War (the 16th century). That is why the watch tower is also called Kiyosu Yagura. Although the number of watch towers is very small, the scale is more impressive than other castles due to the capacity of Nagoya Castle’s watch towers. Moreover, Nagoya Castle had a series of huge roved corridors which surround the main enclosure of the castle. It was called Tamon-Yagura and was also a gigantic store-room for weapons and armor. The width of the corridors was about six meters and the dimensions were equal to more than 300 watch towers from other castles. Unfortunately, this has not been rebuilt yet after it was burnt down by air raids during the Second World War. I wrote in my previous article that enemies could not enter through the castle gates or other places. The reason is the existence of this huge series of corridors. It was impossible to break into the main enclosure of the castle through the strongest gates and the roofed huge corridors at that time. 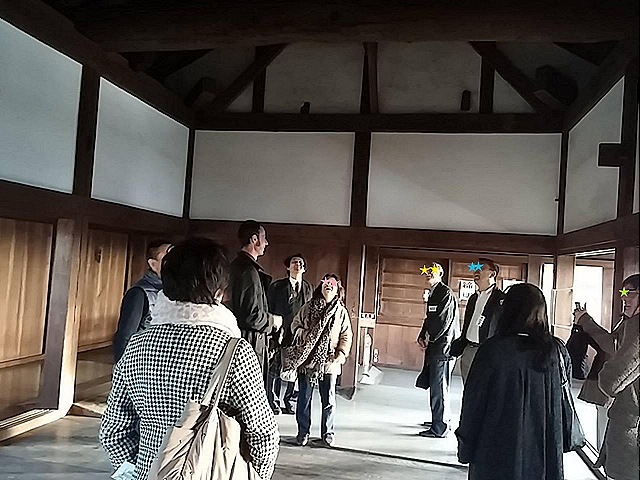 Actually, the corridors had a disconnected fireproof compartment, and the idea of fire protection was introduced to castle architecture for the first time in Japan. 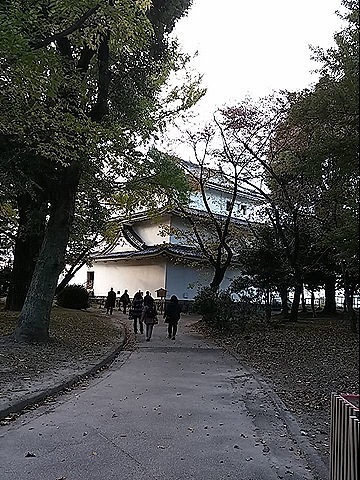 Not only its military preparedness but also the concept shows that Nagoya Castle was the most advanced architecture in Japan in the 17th century. 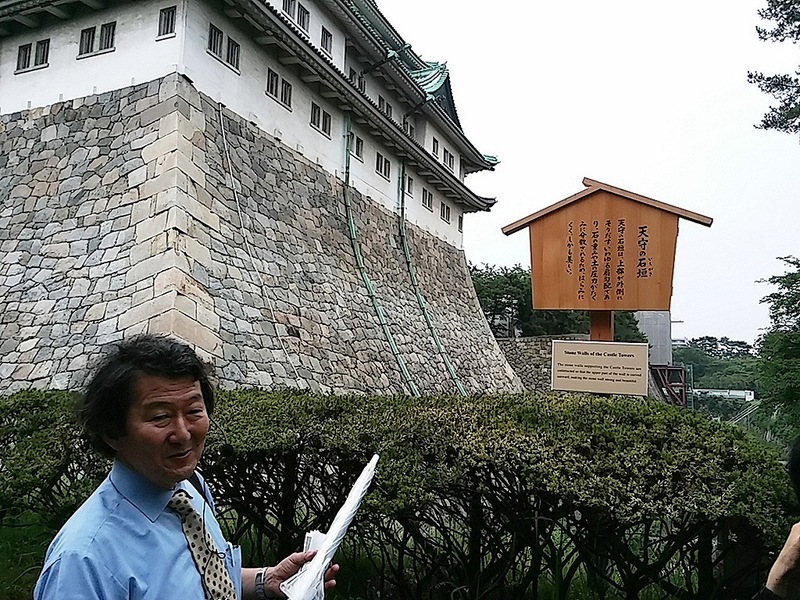 Professor Miura shouted, “Nagoya Castle should be rebuilt to its original style including Tamon-Yagura! It is Nagoya City’s duty!” Yeah! I would like to see the beautiful appearance of Nagoya Castle with the legendary Tamon-Yagura! In the middle of the Edo period, the Tokugawa Shogun Yoshimune imposed strict rules throughout Japan due to fiscal austerity. The constraint extended over samurai warriors, who were controlled by the Laws for the Military Houses called Buke shohatto in Japanese. That is, he prohibited the nation from enjoying dressing up, extravagant ceremonies, festivals, going to the theater and so on. However, Tokugawa Muneharu, the domain lord of Owari, which is now called Nagoya, disobeyed him. He ignored Buke shotatto and Yoshimune’s order to stimulate the economy. For example, he walked around in richly decorated costumes, held big festivals, built many theaters, and developed red-light districts. That was why, this area’s economy boomed and many people, artifacts, and cultural activities were pouring in from all over Japan. 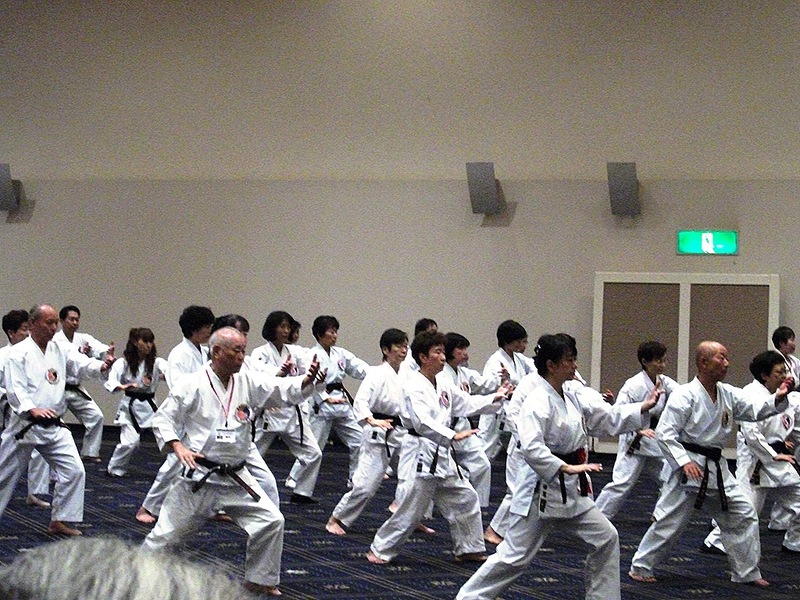 Moreover, Muneharu encouraged warriors to take on other jobs as a sideline. Actually, warriors were suffering economic hardships despite their high status. 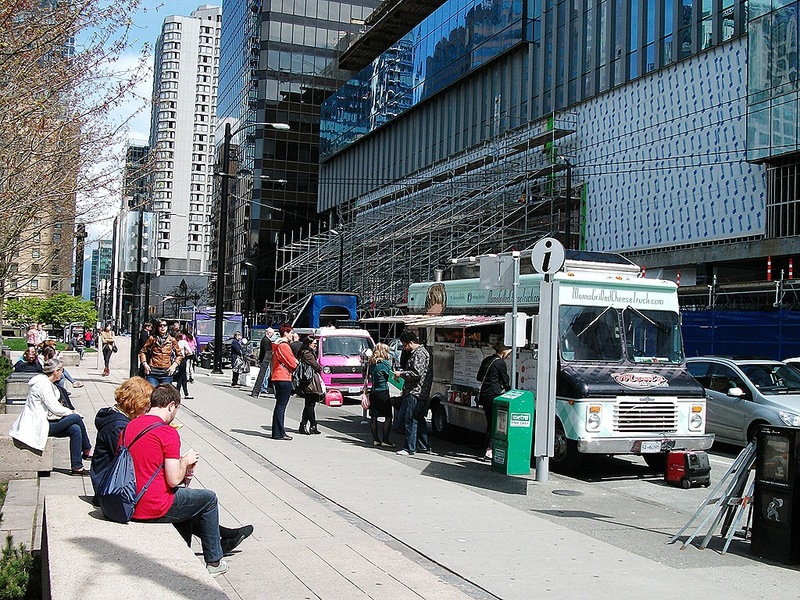 They were able to enjoy leisure activities by this additional income. Most of them earned money as teachers. There were many small private schools called terakoya here and there in the Edo period. Merchants, farmers, many people learned reading, writing and arithmetic there. It was not only men but also women who studied at these schools. 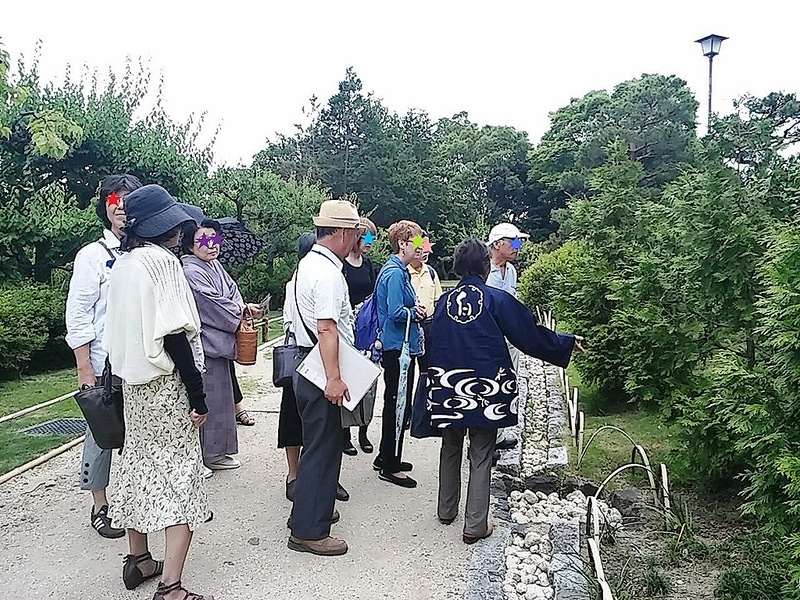 The tour participants left Tsutamo, the restaurant, and went to the site where there used to be the stone monument of Murasaki Shikibu, and Shirakawa Koen Park, which used to be the enclave for the families of American soldiers in the postwar time, and then arrived at a shrine called Wakamiya Hachiman. Wakamiya Hachiman was built in the 10th Century near Nagoya Castle, but was moved to the present place for its castellation in the 17th Century. 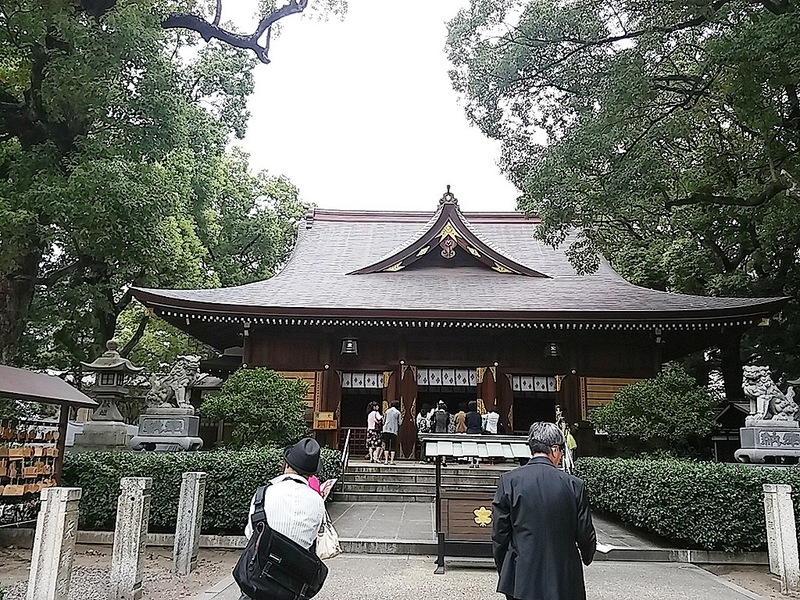 Actually, there are other shrines in its grounds, such as Goshin-i Shrine, and Sumiyoshi Shrine. Goshin-i Shrine relates to sewing. 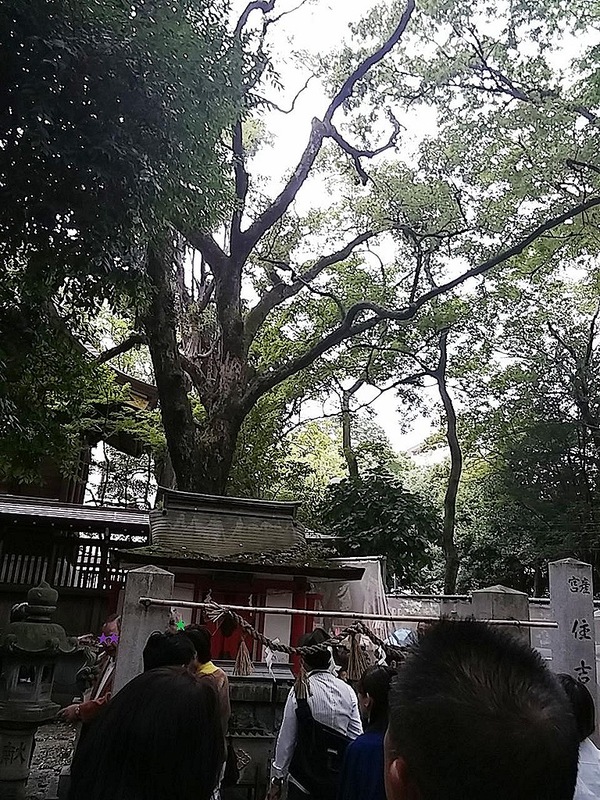 That is why it has a memorial service for broken needles once a year and has many stone monuments engraved with names of apparel companies, such as Brother Industries, Organ Needles, and Kanebo. Sumiyoshi Shrine was built in 1959for preserving nine wind-up dolls, which had been rescued from the fires of the war. You can see the dolls once a year on November 15, which is its ritual day. 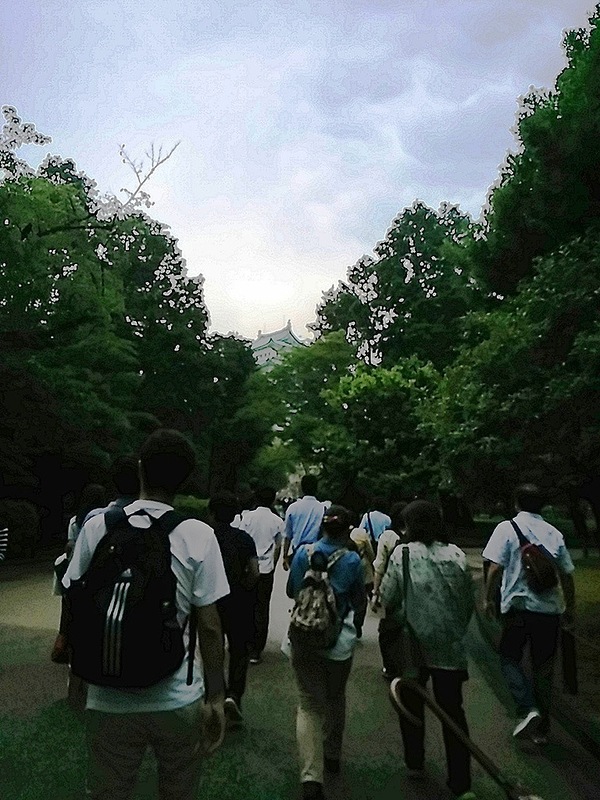 I was able to learn many things about Nagoya’s history through the lecture and tour. The lunch was also wonderful. I had a great time! 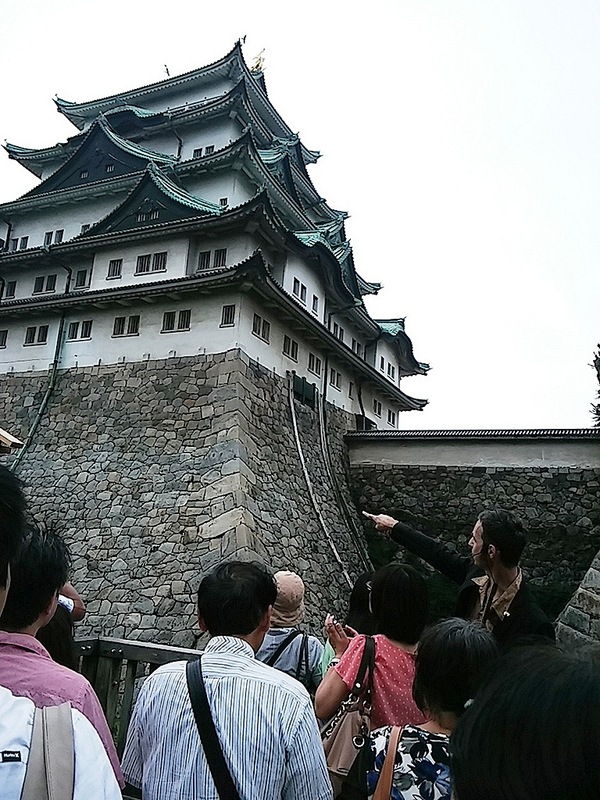 The Study of the Stone Walls of Nagoya Castle : Building stone walls is the same as a battle! “Oh, this is wrong!” Professor Miura shouted, pointing at the information board reading “The stone walls of the castle tower are inclined that the upper parts are curved outwards. This incline is called ‘kata-kobai’ and can bear the heavy weight of the stones and high pressure of the soil. In addition it is beautiful.” “Everything is wrong, except ‘beautiful’,” he added. Actually, the castle tower of Nagoya Castle has S-shaped edges. 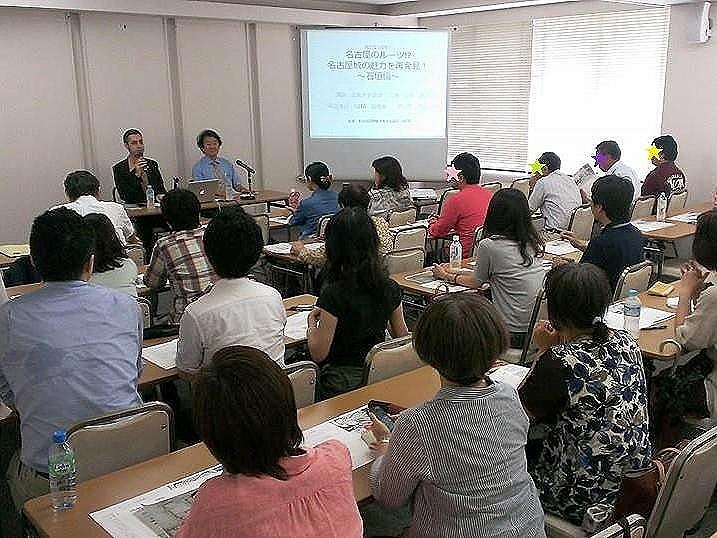 Last Saturday I attended an interesting lecture about the stone walls of Nagoya Castle. 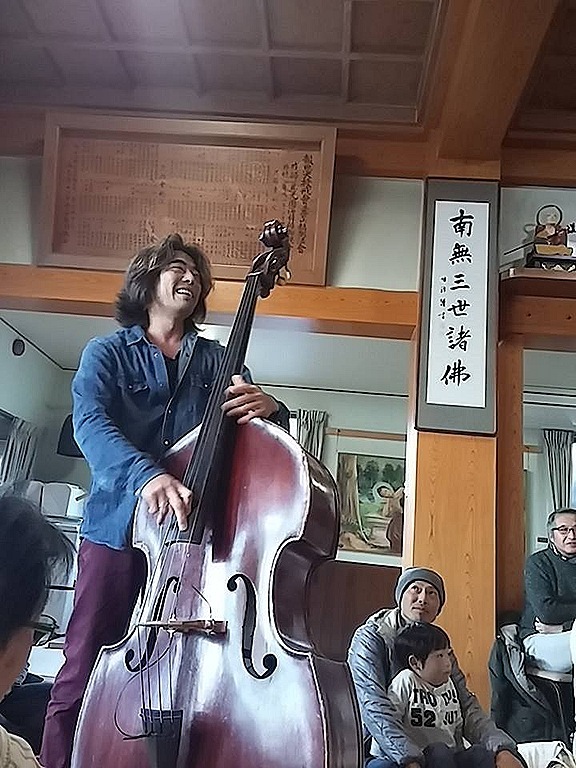 The event was held by Nagoya International Tourism Association (NITA), whose deputy director is a DJ of ZIP FM, Chris Glenn. 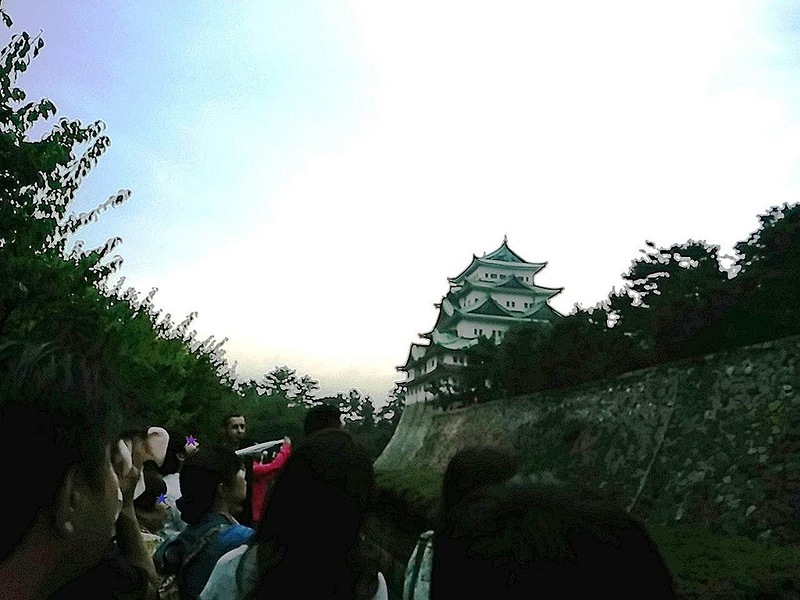 He is famous because he is not only a radio personality but also an ‘otaku’ of Japanese castles. 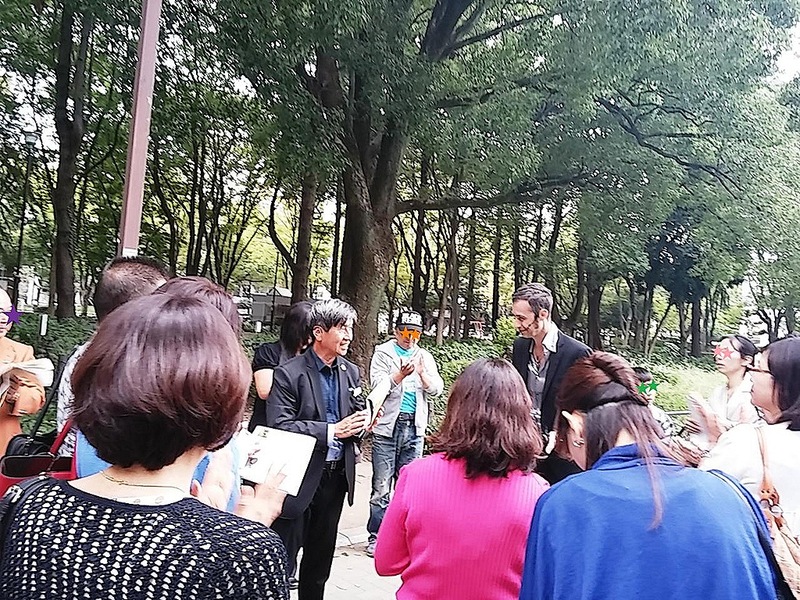 He was the MC of the event, and the lecturer was Professor Masayuki Miura of Hiroshima University, who is a leading expert on castle architecture. 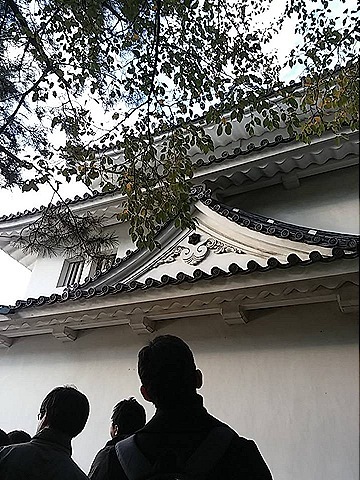 The place where the lecture was held was an oldish spooky building called Ohka-kaikan near Nagoya Castle. 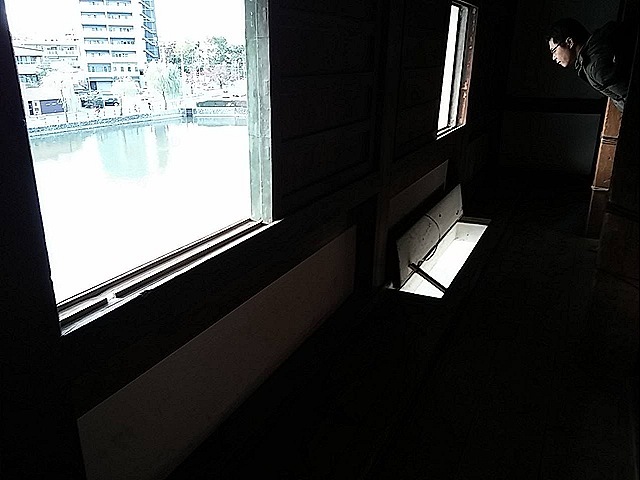 I did not see any ghosts there, but I could not stay inside alone. Along the eerie stairs, I finally opened the door and I felt relieved. There were about 40 living people in the room. Surprisingly, the student sitting in front of me was Nagoya’s Mayor Kawamura. 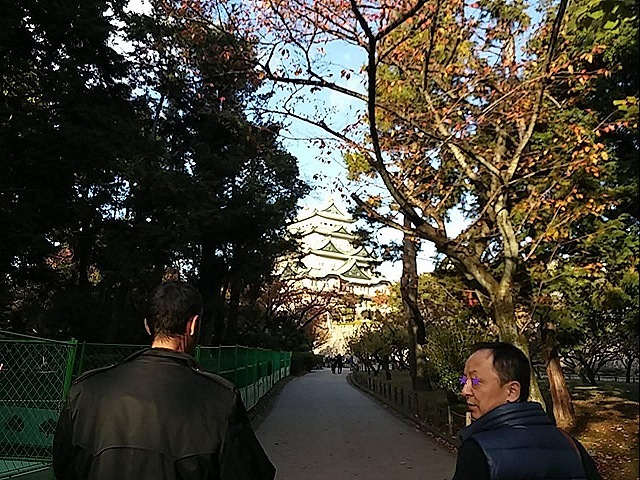 After the 90-minute class about the stone walls of Nagoya Castle, the participants went to the castle with Professor Miura and Chris. I had visited the castle many times, but it was the first time for me to look at the stones so intensely. Nagoya Castle was built on a marshy area to prevent invasion by enemies. That is why, the castle tower has been sinking since it was constructed about 400 years ago. You can see a Chinese character which expresses the number three on a stone in the second layer of its stone walls. It means that the stone used to be on the third layer. The first layer has sunk completely below the ground. The castle tower does not lean because of its method of construction. 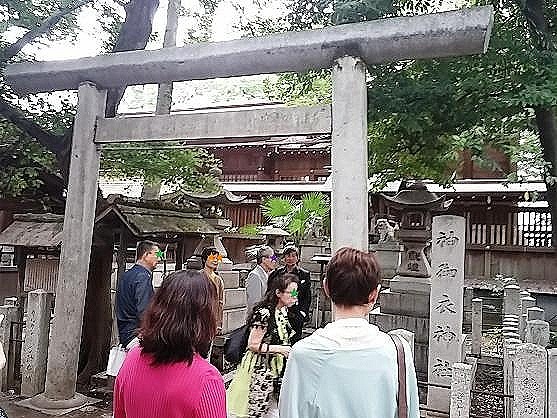 There are wooden bars called dogi under the base stones. They make the building sink uniformly. It seems the castle has sunk from 50 cm to 1 m during 400 years. 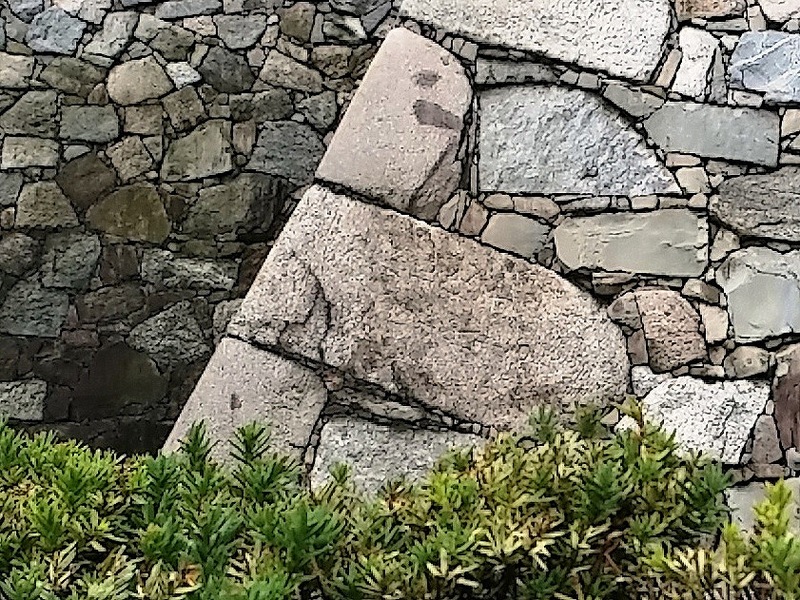 Most of the stone walls of Nagoya Castle were piled by the two ways mainly: Nuno-zumi (to make all of the layers uniform height) and Ran-zumi (to pile the stones at random). 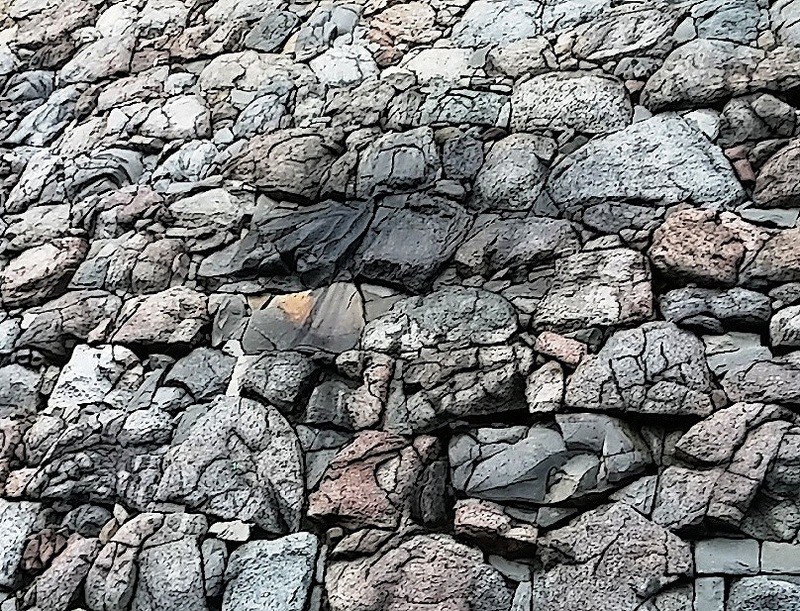 The arrangement of stones has also two methods: Uchikomi-hagi (to fill gaps with small stones) and Kirikomi-hagi (to put the stones without spaces), and the castle’s stone walls were mostly made by the former. 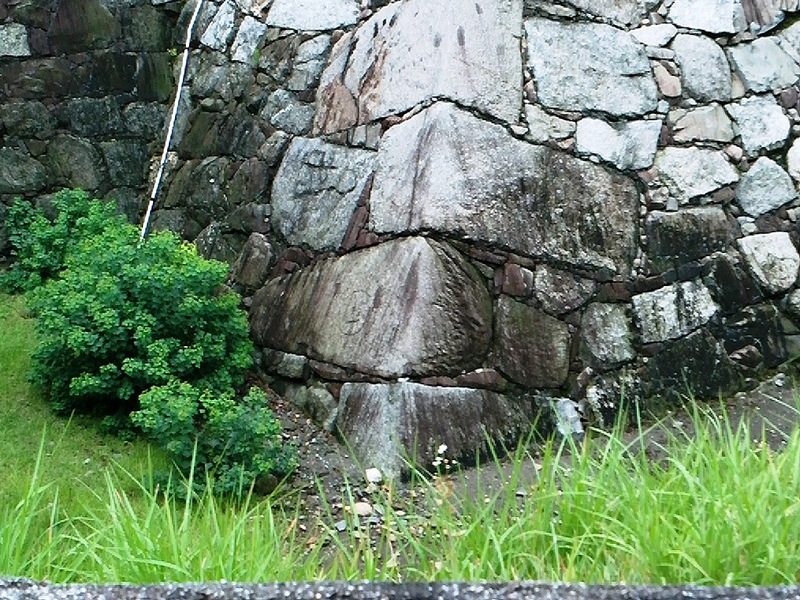 But since the Meiji era, walls have been mended by the technique called Tani-zumi, which is to put stones in sideways. It is because the method is easier to pile stones and it looks beautiful. The strength, however, is much inferior. The length of the stone walls of the castle is about 8.2 km. This large scale construction was done in just a half year. The founder and first shogun of the Tokugawa shogunate, Ieyasu Tokugawa ordered 20 feudal lords to build the stone walls to prevent their rebellion, and he took away their money and drive power of opposing to him. Those lords were subordinate warriors of Hideyoshi Toyotomi, who had ruled over Japan before Ieyasu. Nagoya Castle needed three times as many stones as Hideyoshi’s Osaka Castle, and the scale of its castle tower was as four times as big as Osaka Castle. All of the stones for building Nagoya Castle were quarried from Shinojima Island. They were carried along the Horikawa River via Ise Bay. You can see words or marks carved on stones in the castle. It was to prevent the different building teams from stealing each other. 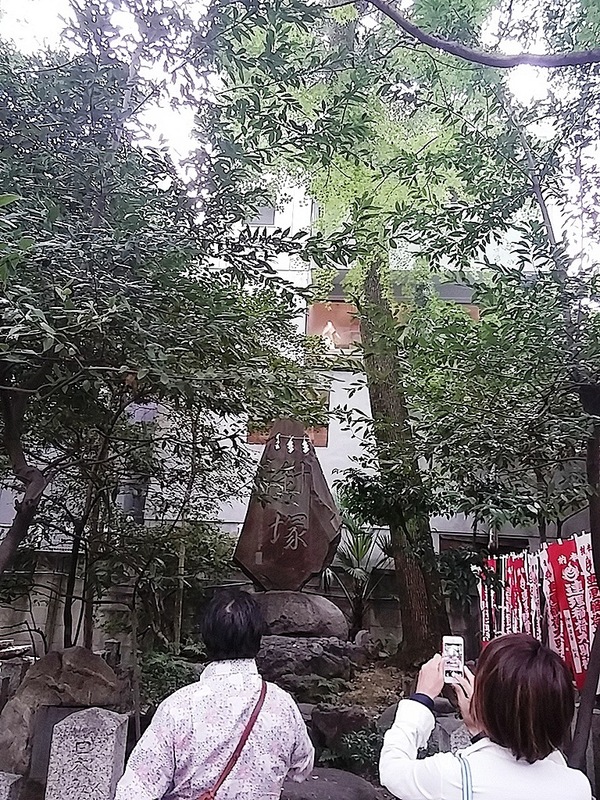 But there was a big stone under the castle tower on which the name of a powerful lord, Kiyomasa Kato, is carved to assert his power in perpetuity his power. 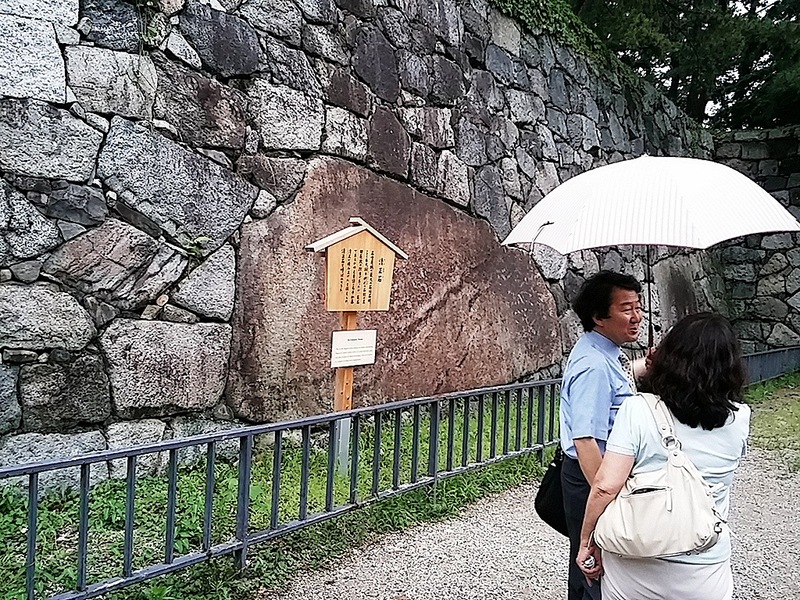 Speaking of Kiyomasa Kato, there is another big stone called “Kiyomasa-ishi”, or Kiyomasa’s stone, in the castle. It has an information board explaining that Kiyomasa was standing on the stone when it was carried into the castle. However, Professor Miura denied the story. According to him, the stone walls which have so-called “Kiyomasa-ishi” were made by another lord, Nagamasa Kuroda, whose father, Kanbei Kuroda, is the protagonist of the long-running historical drama on NHK TV this year. Professor Miura claimed that the stone should have been called “Nagamasa-ishi,” or Nagamasa’s stone! 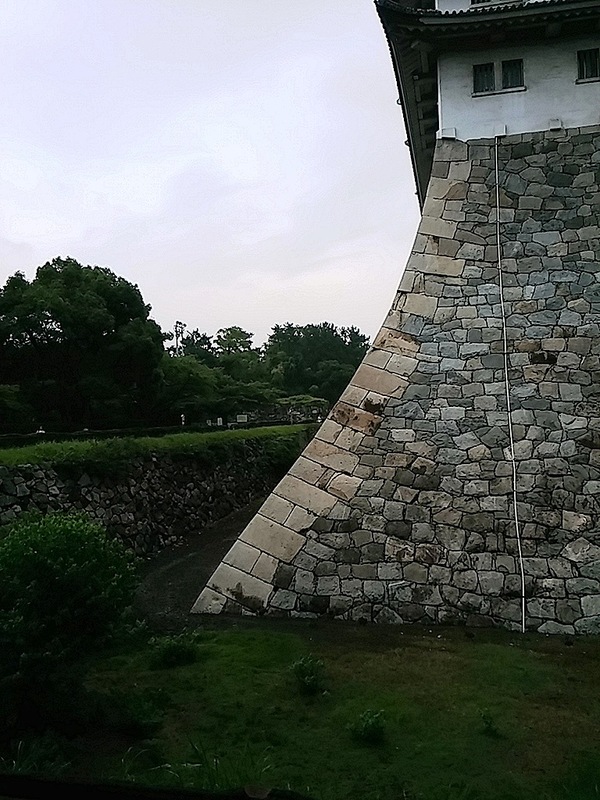 Actually, I learned much more about the stone walls of Nagoya Castle. I cannot write all of it here! I had never thought that I could learn so many things about the stones and the castle’s walls, nor looked at them so intensely before the lecture and tour. 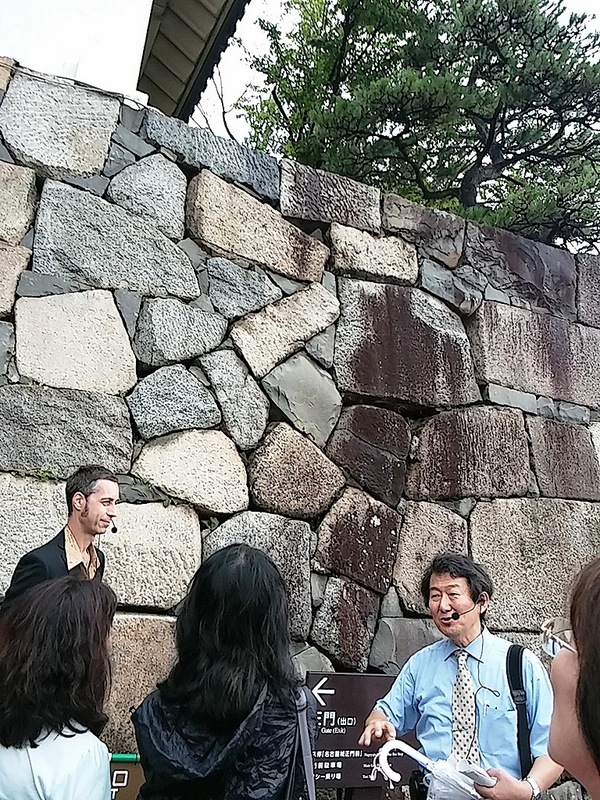 Professor Miura and Chris talked passionately about the castle and its stone walls. I am sure they can enjoy drinking for at least three hours with the theme…Professor Miura said, “Nagoya Castle is the best in Japan to study the stone walls!” And Chris said, “If you want to see Kiyomasa’s name clearly on the stone, you should come here at around 4:30 p.m.” Well…why don’t you come to Nagoya Castle to see the stone walls and stay there until the closing time? 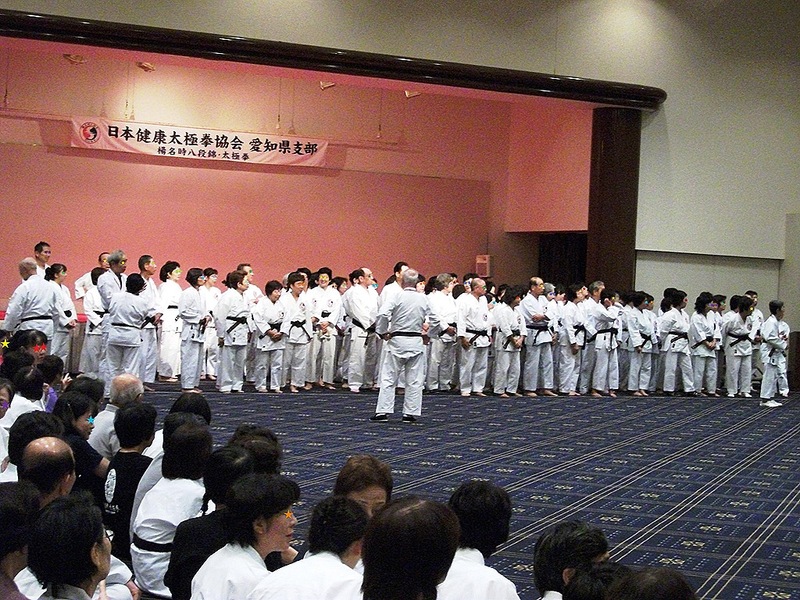 There was an interesting event in Shirotori Garden near Atsuta (-Jingu) Shrine last Saturday. They invited some foreign ladies who live in Nagoya and got them to talk about Japanese culture showing their own art works. 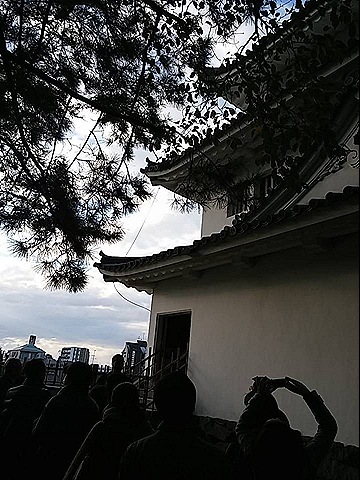 Actually, the event had other programs: Tea ceremonies and English guided tours. I decided to take part in a guided tour at 10:30 and then go to the talk show at 11:30. It was my first time to visit the garden, though I have lived in Nagoya for a long time. 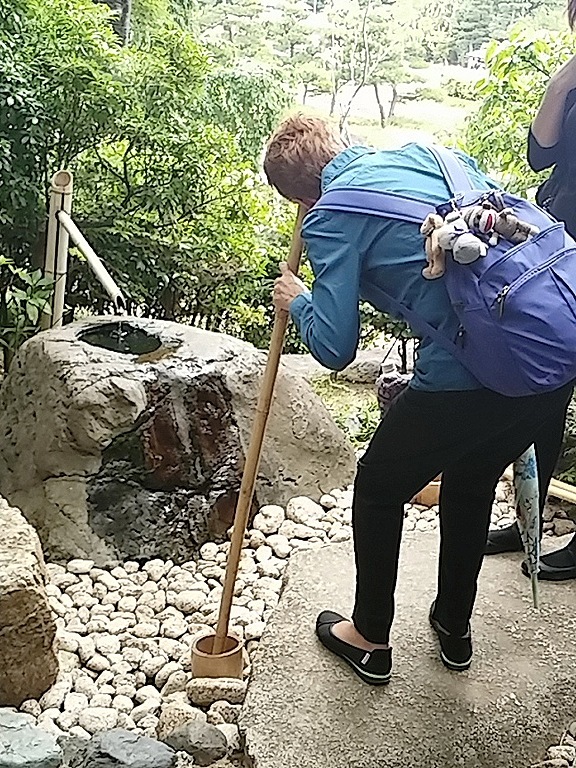 One of the reasons is that the park requires an entrance fee: 300 yen for adults, 100 yen for citizens of Nagoya aged 65 or older, and free for children under the age of 14. If you come to the place with a one day ticket for Nagoya City’s public transportation, you can enter for 240 yen (20% off!). The English guided tour was supposed to start at 10:30, but the tour had already started when I arrived at the gate before 10:30. One of the staff members explained that they had made a group depart earlier because more people had gathered than they had expected. According to her, the next group would depart later. But I decided to join the first group because I found two of my friends in it. This place is located by the Hori-kawa River. 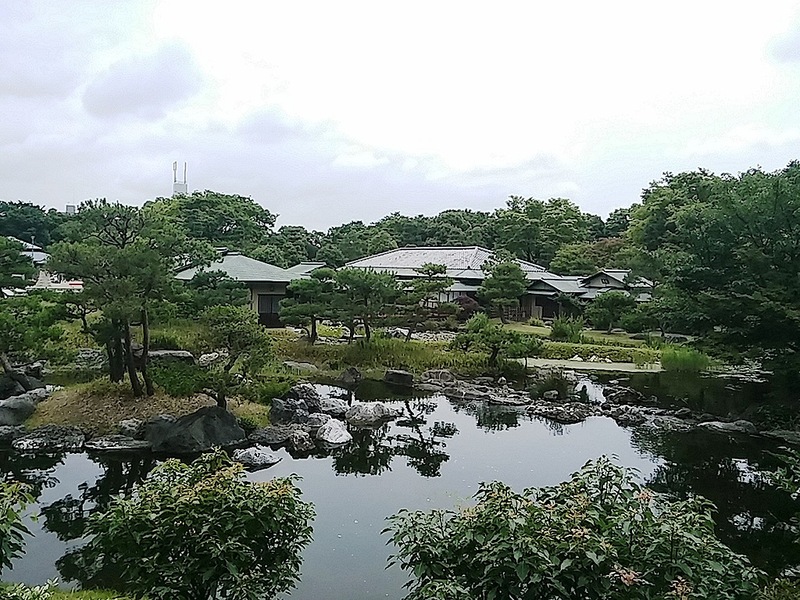 The river was canalled to carry building materials for Nagoya Castle in the Edo period (the 17th Century), and the site of this garden used to be a pond for keeping the timber. After the completion of the castle, the place had been used as a lumber port. But Typhoon Vera a.k.a. the Isewan Typhoon in 1959 brought big damage to this area and the timber yards were decentralized. By the beginning of the 1980s, the lumber port was no longer required because of the decentralization and increasing imported materials. 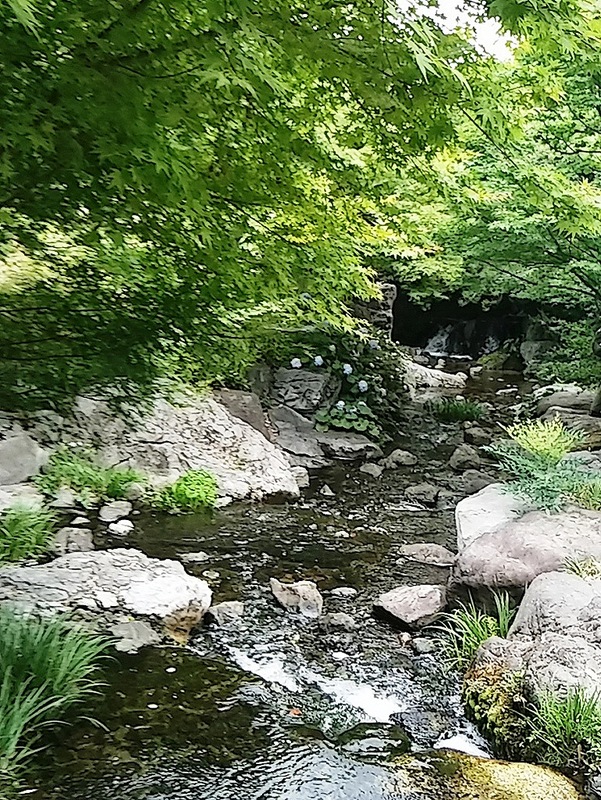 Then, it was reborn as a Japanese garden for the World Design Exposition in 1989. 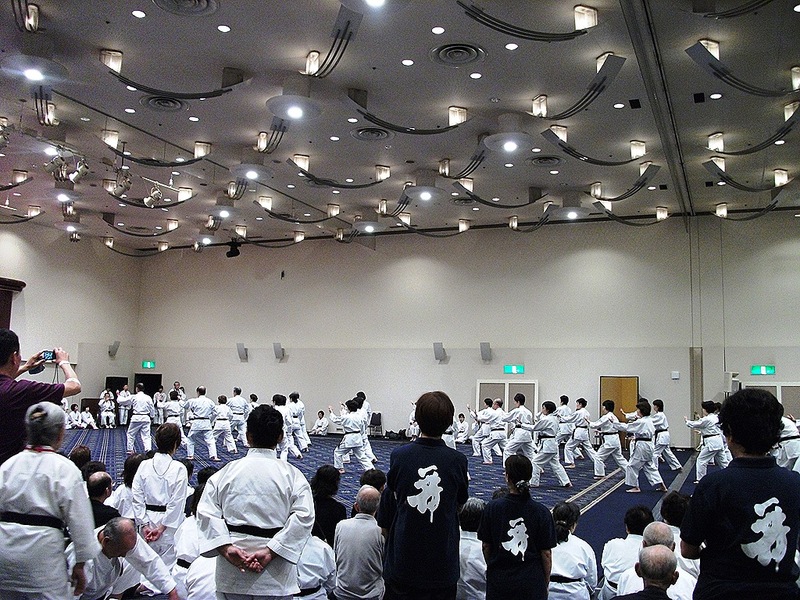 After the event, it was opened to the public. This garden features a path around the pond and is designed to express the landscape features of central Japan. 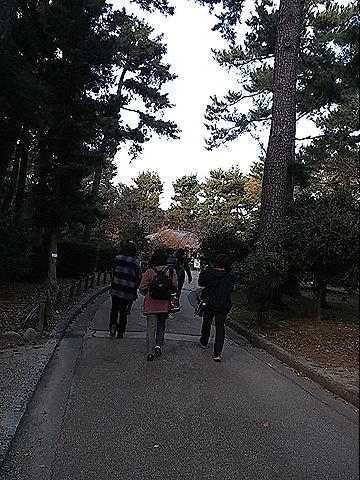 For example, there is an artificial hill near the gate of the garden. It represents Mt. Ontake in Nagano Prefecture. The big pond in the center of the garden represents Ise Bay and the stream the Kiso River. 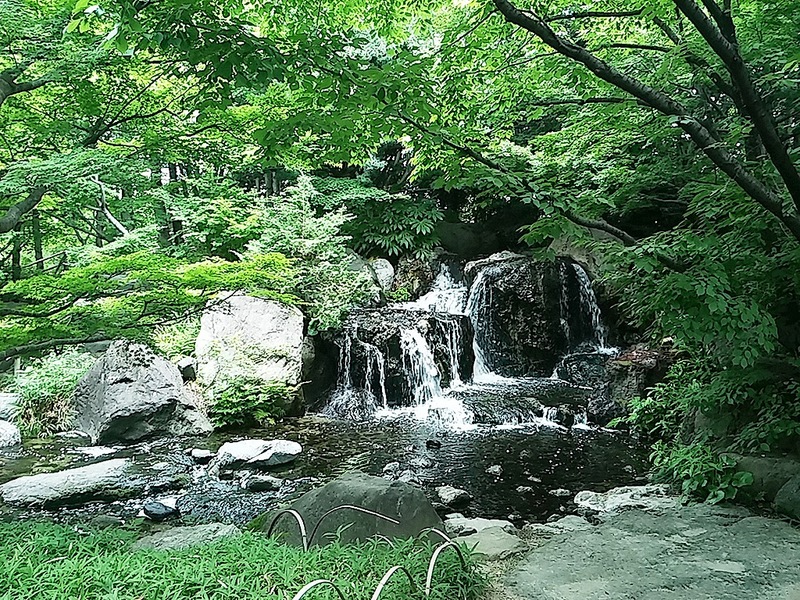 The garden even has a mock spot called “Nezame-no-toko,” which is a famous scenic place in Nagano Prefecture. 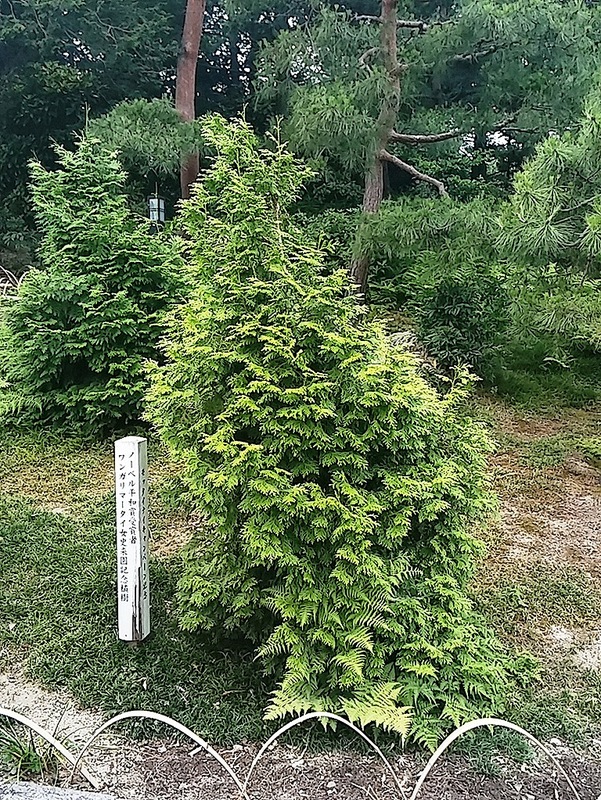 The garden has a cypress tree planted by Ms. Wangari Maathai, who was a Kenyan political activist and recipient of the Novel Peace Prize in 2004. She was very popular in Japan because she promoted an environmental protection campaign in 2002 using a Japanese word, “mottainai,” which expresses a sense of regret and concern over waste. It also has a tea house and Suikinkutsu, which is a garden ornament and music device. Many flowers and trees are in the garden, and they show you different expressions each season. Hydrangeas and gardenias were in full bloom when I visited the park. The beautiful autumn leaves will welcome you in the fall. Even after snow, you will find breathtaking scenery there. The entrance fee of 300 yen is reasonable for the beautiful site. 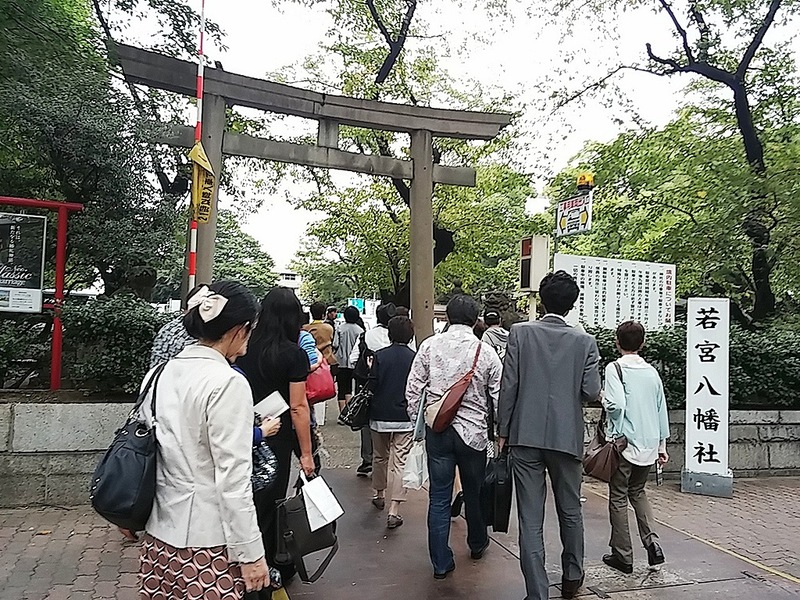 Why don’t you come by Shirotori Garden when you visit Atsuta (-Jingu) Shrine? 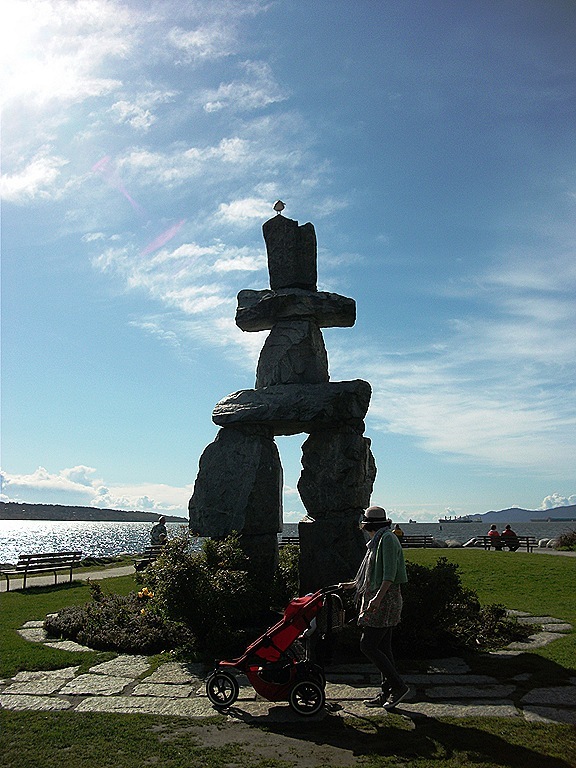 My Travel in Vancouver 9 (Day 4 Part 2) ~ Falafel King & English Bay Beach ~ This place is safest! I wouldn’t want to wait for a bus alone here if it were a rainy night now…I was waiting for a bus at Lost Lagoon Road after the horse-drawn tour. 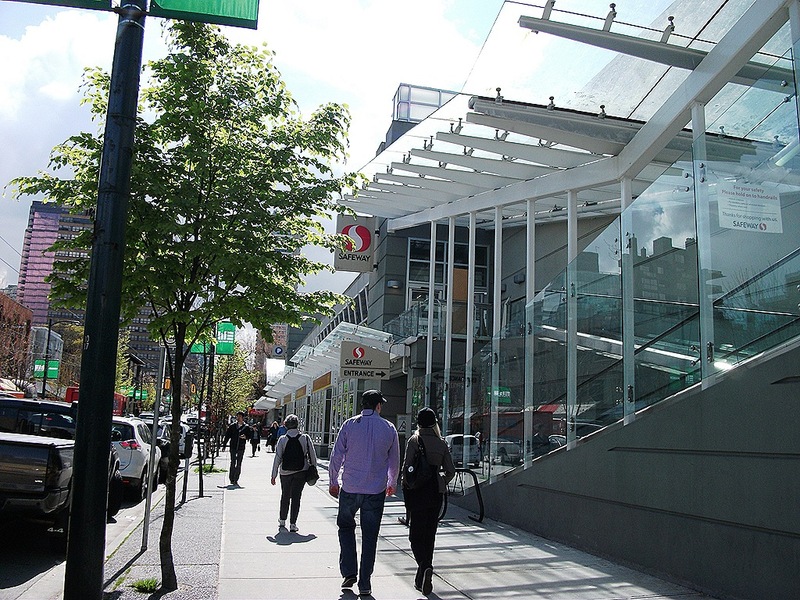 It was an isolated bus stop by a concrete tunnel under the raised highway and away from any popular sites of Stanley Park. I did not see or hear anyone around there. Although I was standing by the bus stop, I was worried whether a bus would really come. The bus stop had no timetable. My only consolation was that the weather was nice. To my relief, a bus came soon. To my surprise, suddenly about half a dozen people appeared as if from nowhere when the bus came into view, and they got on the bus before me. In just a few minutes, the bus came to the place where I was going to get off. 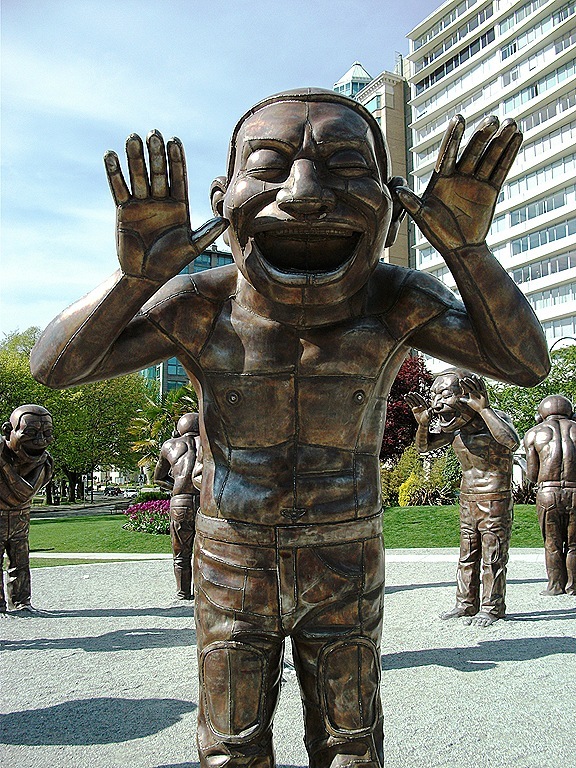 I got off the bus near Denman Street and started walking to a Lebanese restaurant. I had happened to read many recommended reviews of the shop’s “Chicken shawarma platter” on the Internet previous night. I had never tried Lebanese food. It was almost noon and I was hungry. 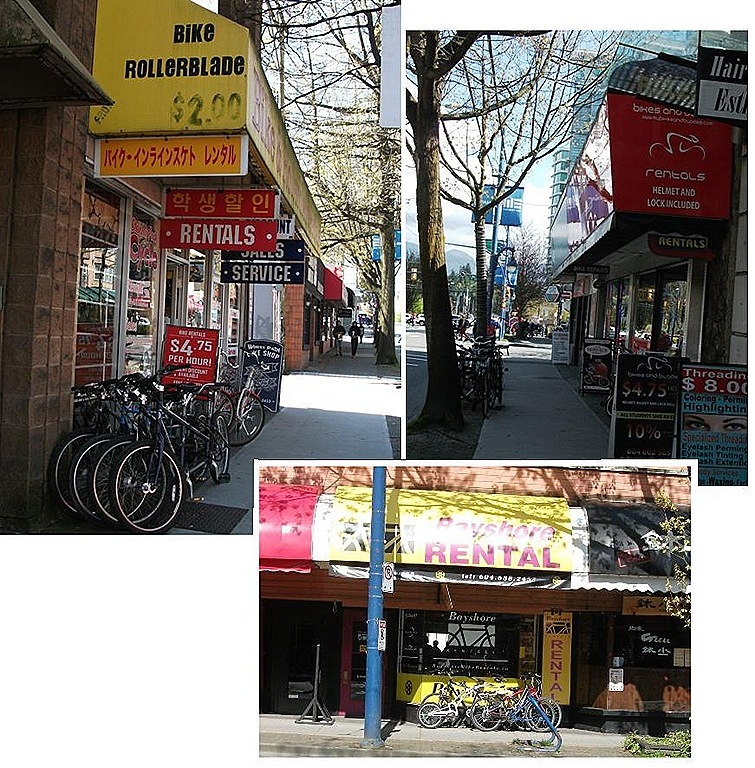 Interestingly I found many bike rental shops on my way at Denman Street. While wondering why, I heard a familiar language. I turned around, when half a dozen bikers wearing the same silver “Alien”- looking helmets were about to park their bicycles before a grocery store. They appeared to be female Japanese tourists. Probably they were going around the city by rented bikes. From the sound of their voices, they seemed to be over the age of 60. 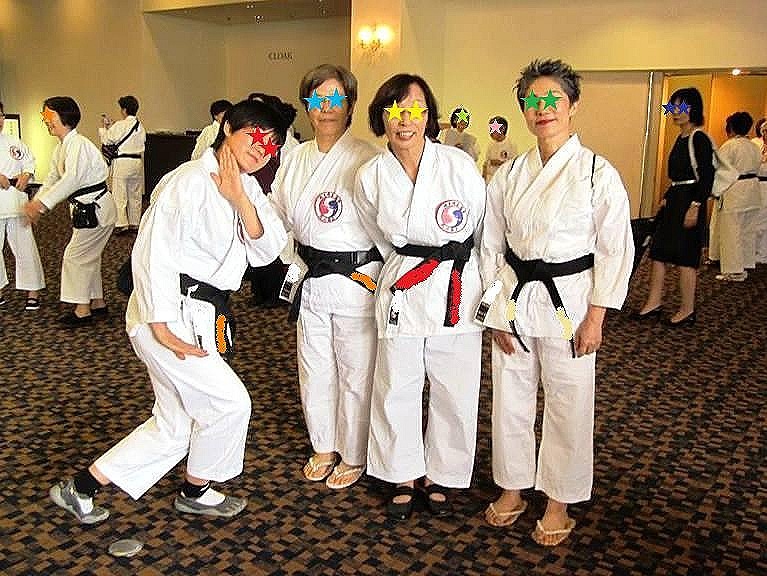 Japanese seniors are quite hale and hearty! They might have rented their bicycles around here. 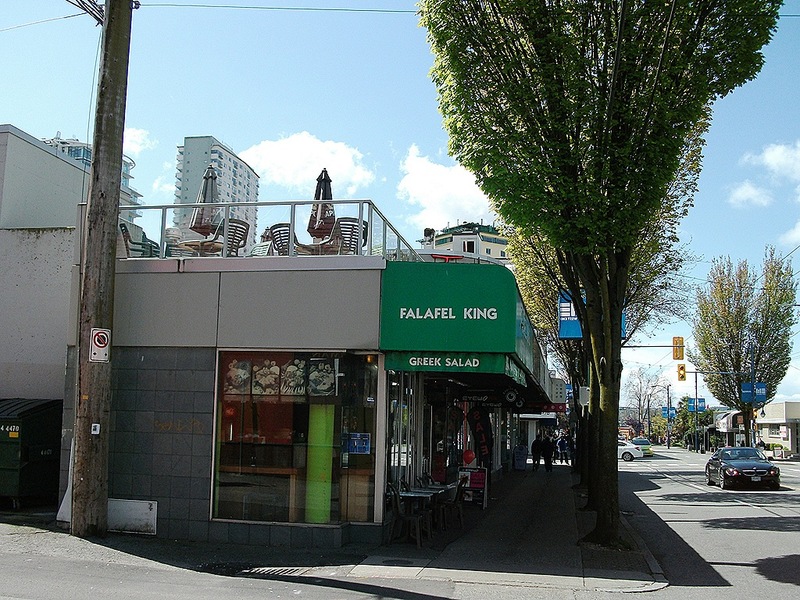 Passing by a community center, a secondary school, and public library, I found a green canopy of the Lebanese restaurant ahead: Falafel King. When I opened the door, I was enveloped by a spicy aroma. The shop was tiny. There was a small table with two chairs by the wall and a counter table with several seats by the windows inside. I found an empty seat at the counter, but hesitated for a moment to eat there because all the other customers were big young men. At first glance, I felt it was no place for a middle aged Asian woman to dine alone. However, I was relieved a few seconds later. When I looked around again calmly, I found that all the customers were wearing the same clothes with the same word on their backs: POLICE. Yeah, I saw a police car outside from the window. 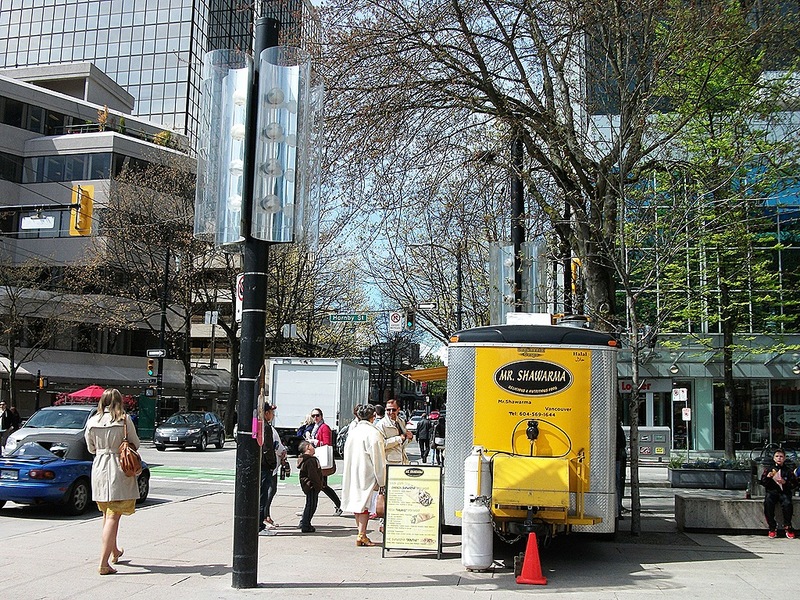 This must be a favorite restaurant for police officers of Vancouver and the safest place in Vancouver now! That was why, I replied brightly, “For here,” to the question of the shop master. But I could not answer to his next question. He asked me what to order, but I did not remember the name of the recommended food on the Web. So, I said, “Actually, I don’t know the name, but many people recommend it on the Internet. It’s chicken something…” To my surprise, he completely understood what I wanted to eat, and started preparing my lunch. Chicken shawarma platter. Chicken shawarma is the same as the Turkish “Doner kebab.” The chef sliced the grilled chicken dynamically and piled it on the rice. Then he put a salad of parsley and tomatoes called taboule and mashed chickpeas called hummus on the same plate. “Sauce?” he said and I asked him to put it on. Although a police officer who had ordered right before me had declined the sauce, which seemed to be a little hot, I decided to try it. 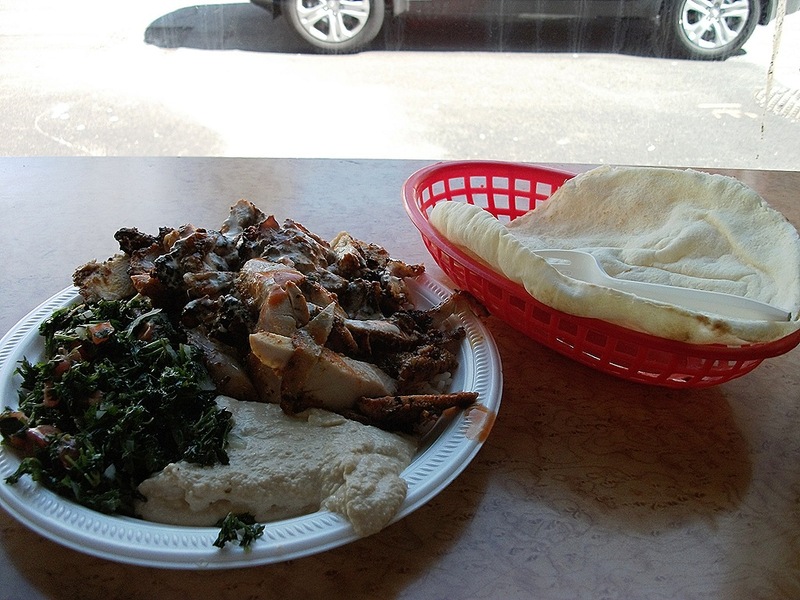 Actually, Chicken shawarma platter was not just the one plate. It was served with a flatbread. Can I eat the whole thing? The lunch was delicious. I liked the Lebanese food very much. But I could not finish it all. When I told the chef that I was full, he gave me a take-out container. How kind! After lunch, I dropped by Safeway, the supermarket, to buy some batteries for my camera, and then took a walk downtown. The weather was incredibly nice that day. People looked like they were enjoying the sunshine. There were many food catering vans at the side of the road here and there. It was a great day to have lunch outside. 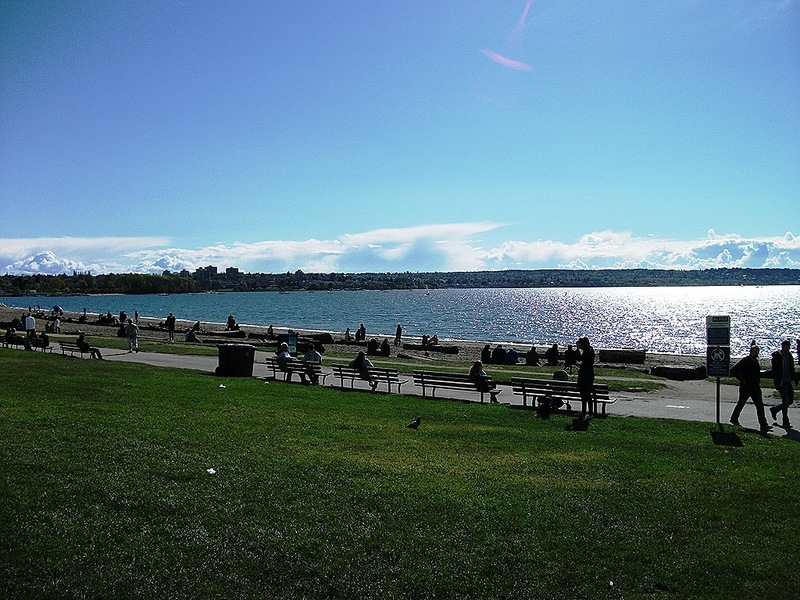 After strolling about the town and shopping, I went back to my hotel to rest, and then I walked to English Bay Beach in the evening. It was after six o’clock, but it was still light outside because the sunset was after eight. Now I am back to a normal life in Japan. The days in Vancouver seem to me like a short dream. Ah…I want to go somewhere again!